After marveling at Maha Muni and sharing breakfast with the friendly Cho Gyi, I got on a small bus for the 6-7 hour ride to Bagan. While there was an 8.30 sked for departure, they follow the familiar "alas puno" (leave when full) system we also have here. I was the only foreigner in the bus station but I felt very much at ease. Two hours into the trip, we made an early lunch stopover. Heavens, I bumped into Jasper, Ironwulf's other travel buddy who's also having an early lunch. He's on his way back to Mandalay after only a day in Bagan. It was a pleasant change as I can talk and swap stories with someone who can fully understand me after almost two days of being on my own. I got to Bagan at nearly 5pm but finding my budget accommodation, Eden motel, was easy. I was really tired so even through the midnight power outage, I slept on. Here's when things got very interesting.I was roused at 3.30am by a staff and led to a waiting taxi (actually, a van). Bleary-eyed, I didn't query the driver much if this was indeed for me, as he understands very little English. My thought balloon: did they upgrade my horse cart ride to a taxi? I have no one else to ask at this hour. As it turned out, the trip was bound for Mount Popa, over 30 miles away. Speeding through the hilly terrain and dark roads, we reached Mount Popa way before sunrise. The town was just rousing from slumber as we ate breakfast. Climbing up the stairs, sweepers were cleaning up as macaques play with each other rambunctiously. The summit is at 4,981 feet so I took my time ascending (largely avoiding the macaques' poop). It's also good to observe the locals streaming in and engaging each other in chatter since the hike up was not a joke. 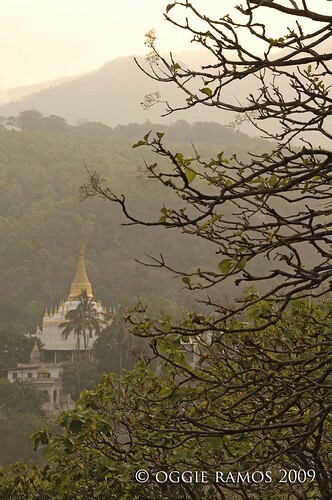 Mount Popa is considered as the Mount Olympus of Myanmar, being the home to the nat.T he nat is a group of spirits the Burmese have paid homage to even before Buddhism was introduced here. According to tradition, the nat can protect the believer and can be appeased by offerings. The view at the top is invigorating, seeing the mountainside dotted by stupas of varying sizes sharing space with houses and shops. It didn't take long for the crowds to arrive. Going back to Bagan and passing through the roads weaving through the dusty plains, I get glimpses of the rural life -- monks getting their food from eager donors; locals filling the scarce transport vehicles; people walking along the dirt roads. 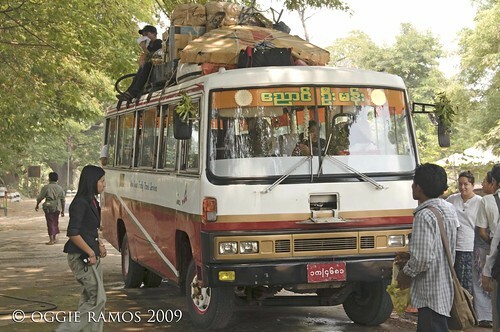 It was only when I got back to Bagan when I realized the mistake -- the trip was meant for another guest. You can just imagine my chagrin as the mistake set me back 30,000kyats (roughly US$30) when I've already paid my horse cart rental 12,000kyats in advance the previous day. 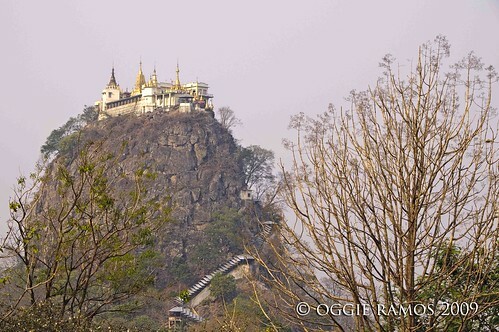 But looking back, I thought maybe, just maybe, I was really meant to climb Mount Popa. Maybe the mountain was calling out to me to visit. It wasn't a textbook kind of trip for me but I loved it. wow! bai i should say that this is my favorite post. it's always the experience of going to unexpected unplanned trips that makes it more exciting and very memorable. if it happened to me, i might have the same feeling. the bus looked dangerous but again, it's those experience that im really after. i like temples in the middle of nature. What happened to the hotel guest who was supposed to take the taxi you took? I imagined he took the horse cart rental you reserved and paid for in advance. These minor glitches when traveling make it more memorable, doesn't it LOL. dom, it proves to me that things have a way of unfolding by themselves. it's well and good to come prepared but be also open to surprises. thanks for dropping by, bai. You have certainly captured the beauty of Myanmar. Beautiful photos. I noticed you and Ferdz have a very similar photographic style. dennis, considering that ferdz is one of my blog and photography idols, that is one big compliment. salamat for dropping by :D glad you like the myanmar accounts. there are a few more in the series so do watch out for them. what a mistake! where's your horsecart supposed to bring you by the way? seems to me it was a lucky strike of chance! Amazing...I wonder how they were able to build that building on top of this huge rock (mountain). If you have the time try to read Amy Tan's novel about Myanmar. Saving Fish from Drowing. bai, daming poop, you have to walk carefully to avoid stepping on them. ang gugulo pa nung mga macaques. i agree naman, things happen for a reason and plans have a way of changing and morphing themselves. ang worry ko lang naman is my diminishing cash then but it was a nice detour. WOW. this is what i really call an adventure. honestly, di ko sure kung kaya ko yan. all the pics are great but there is something in the last pic that is worth remembering. oman, i have a feeling you can go through this and emerge wiser for the experience :) i sure learned a lot of things including how to get along well with everyone even when things went wrong; also how to improve my communications skills (that includes sign language :D). kakatuwa nga yung last image kasi it reminds me of how things are here. bait ng mga yan, they waved pa and smiled when they saw me. Wow! 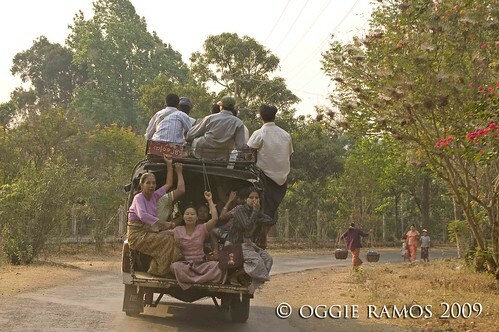 This is quite a detailed account of your Myanmar adventure. It is as if we readers are touring with you. Photos are excellent too! wah, ang galing ng detour mo, Oggie! i have a Thai friend who went to Bagan and told me some nice and interesting stories about Mount Popa. sabi niya, magugustuhan ko daw dun. and reading your entry confirms it. binilang mo ba yung steps? 777 steps daw yun eh tapos mag-wish ka sa taas at magkakatotoo. haha. imbento ko lang yung wish, ginawa ko din kase yun sa Batu Caves sa KL pero 200+steps lang yun at inakyat ko ng walang pahinga para lang sa isang wish. bano ba? pero pramis, kung pupunta man ako sa Burma, dahil lang sa Mount Popa at shempre yung mga nagagandahang pagodas nila. rayts, fate dictated my detour so i have no recourse but to take it. na-enjoy ko naman. i was too sleepy to count the steps and too busy to evade the macaques' poop. i think all i wished for are a good capture and that i'll return to the philippines in one piece :P mount popa wasn't really in my itinerary pero it happened. 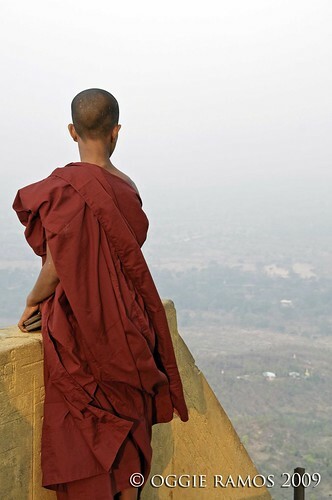 you'll like myanmar, i'm pretty sure of it.